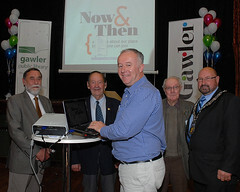 The Gawler History Team Incorporated [GHT] Wiki, “Gawler NowAndThen” was launched on 27th May, 2012. 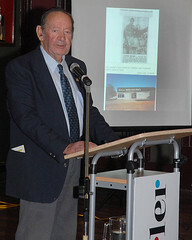 Following the Inaugural Gawler History Lecture, given by Dr Dean Jaensch, the 150 people present in the Gawler Institute heard Gawler History Team Chairman Brian Thom introduce Dr Bruce Eastick AM, who was invited to perform the official launch of the GHT Wiki. During Brian’s speech, flowers were presented to Nicole Stomaci by GHT member Michael Hemphill, in recognition of the appreciation of the Team towards the tremendous amount of valuable time, effort and expertise Nicole has afforded to bring the Wiki into existence. GHT’s special adviser Darren Peacock of Sweet Technology was introduced to explain the various aspect of the Wiki. 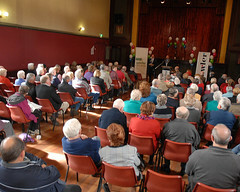 The content of the opening speech and Dr Eastick’s comments can be viewed in the video to the left. View more photos at the launch of the wiki site here. 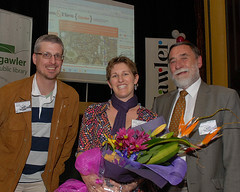 Do you remember Wiki Launch - Now and Then Gawler ? Then Join up and add your memory here.